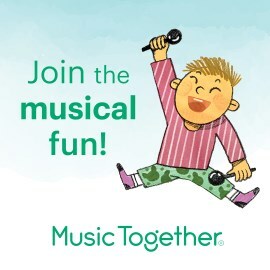 Babies, toddlers, preschoolers, and big kids all love Music Together! Our playful music classes for kids support every child, no matter their learning style or stage of development. Each weekly class includes lots of music activities especially created for young children, led by a trained teacher who inspires everyone to join in the fun. Explore the different Music Together classes offered at Meryl's Music and Arts to find the best fit for your family. Mixed-age Music Class: For kids birth through five and their grownups. Learn and play musically together! For Spring, this would apply to babies born after August 1, 2018. If your first choice is full, call us to be placed on the wait list. Things sometimes change and we can fit you into a class that was previously full. Unfortunately our scholarship fund is empty right now due to the economy, but call us if you'd like to discuss a payment or barter plan!